The universe of smart home automation is fascinating! The idea of making your house intelligent, making your tiring daily tasks occur automatically with no efforts, going beyond the usual experience of your home and centre yourself on tasks and moments that really matters are some of the many reasons to jump into the automation train. Smart home is however a difficult world to enter. Until now, you needed one of two things to join it: enough money or enough skills. 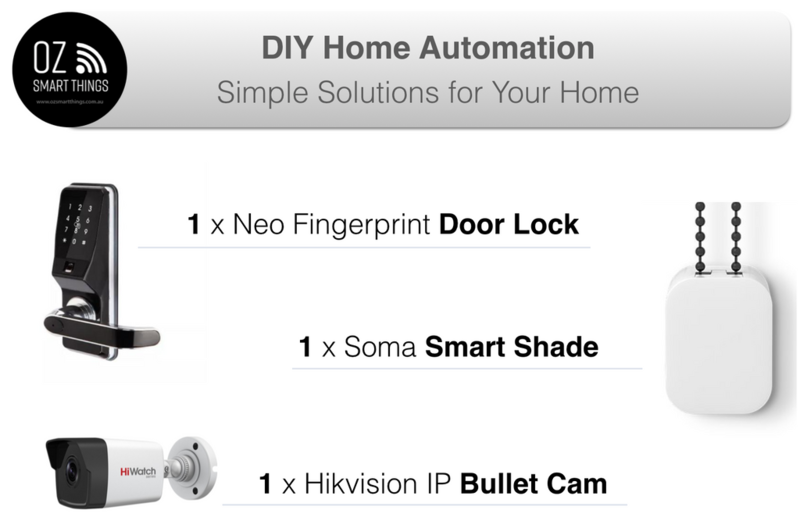 The devices in this kit allow you to Automate the most common issue that people want to resolve without having to use a home controller and very little setup. I think everyone has experienced lost keys or struggle to find them on a daily basis. With the Neo Door lock, this will be a thing of the past. Unlock with your Fingerprint or code. The device is easy to install replacing your original door handle. Insert the batteries follow the easy set-up and you are Done!! Smart blinds are one of the most popular devices in Home Automation as this is a manual task everyone does every day usually at the same time. So wouldn't it be great to not have to worry about this? Soma Smart Shades does exactly this, you can set schedules so the blinds will automatically close in the afternoon open in the morning. This device helps to save energy by closing the blinds when you are not there to keep the heat outside. Installation only takes minutes using the existing cord of your blinds and is also solar powered. This device allows you to monitor your home from anywhere in the world. The HikVision IP Camera is the perfect solution for this. Simply plug into the back of your wifi router using the POE device in the pack, Follow the instructions and you will be able to view the camera's image from your smartphone.